Patients who are registered at Grenoside Surgery have access to a range of service outside the normal surgery opening hours. These are available from 6.30 p.m. to 10.00 p.m. weekdays and from 8.00 a.m. until 8.00 p.m. at weekends. Where a patient is clinically triaged by a GP and requires to be seen within 24 hours or 48 hours at weekends and no appointments are available at the surgery– additional appointments are available at five Satellite GP Hubs across the city. The most local Hub Sites to Grenoside Surgery are at Burncross Surgery and Palgrave Medical Centre. There are also sites at Flowers Medical Centre, Crookes Practice and Woodhouse Medical Centre. 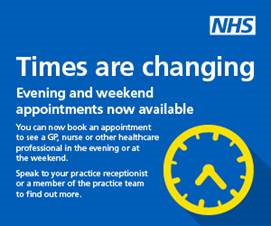 Appointments must be via GP triage and are not available to book by patients directly. A number of Nurse and Healthcare Assistant appointments are available at the Satellite Hubs. These appointments can only available via Grenoside Surgery and cannot be booked by the patient individually. Where access internally to a Nurse or Healthcare Assistant is not possible then the surgery may be able to offer additional capacity if no appropriate appointments are available at this practice. If following a GP appointment a patient is deemed to require a Physiotherapy Assessment prior to deciding on the appropriate referral route, additional appointments are also available with Physiotherapists at the Satellite Hubs. These would be booked for you by a receptionist after your GP appointment. For more information on these services please contact the surgery and ask to speak to the Practice Manager.